Why do girls need Girl Scouts? That is a question that is often asked; the answer varies from girl to girl. The journey begins with the Girl Scout environment itself. A girl’s leadership blooms among other girls—away from school pressures, social cliques, and boys—where she can be herself and try new things. The Girl Scout experience gives young women the confidence and the tools to lead—to find, inside the uncertain girl, the young woman who will make a difference in her world. 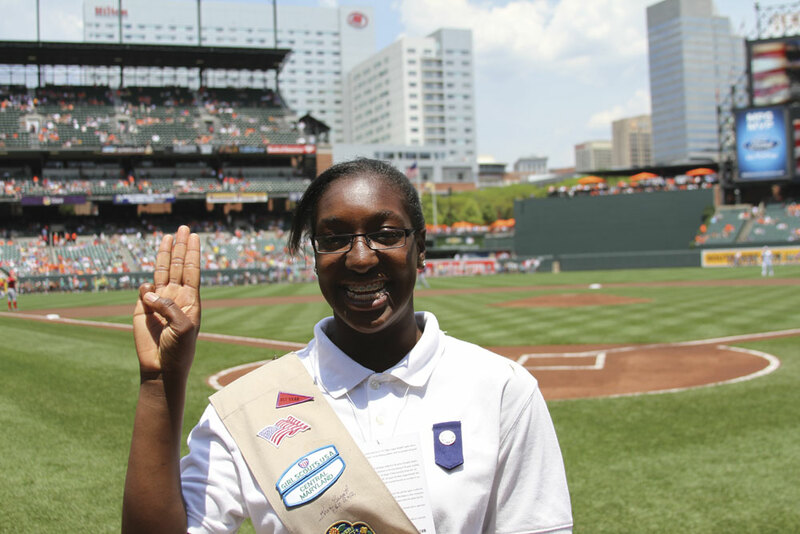 For Girl Scout Roxine the answer is becoming clearer as she reflects on her experiences as a Cadette Girl Scout in Central Maryland. What made you become a Girl Scout? I have been in the United States since I was nine and I had a little bit of trouble fitting in at school. 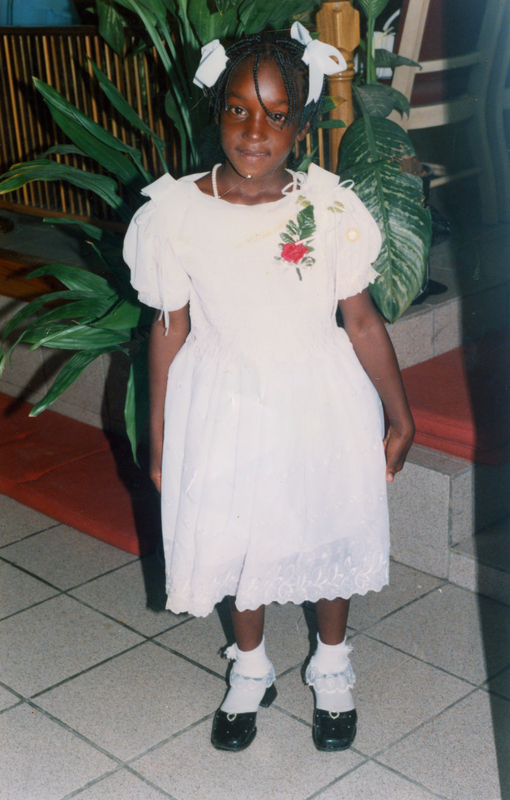 I was a Girl Scout back home in Jamaica and I remember all of the fun I had, so I wanted give Girl Scout s in the United States a shot. When I joined my troop I instantly felt at home. I felt the same feeling of friendship, teamwork and sisterhood as I did in Jamaica. I talk to some of my friends weekly and we can’t wait to see each other in between meetings. What is the most important part of being a Girl Scout to you? One of the most important parts of being a Girl Scout is that I have learned so much about myself. A lot of my peers at school define themselves by their clothes, music or things in magazines. When you meet positive role models you see that you can achieve your dreams and that your actions, intelligence and success can define you better than anything else. How has Girl Scouts benefited you? Being an active Girl Scout, I get to do things that I otherwise would not have a chance to do. How many 8th graders can say that they have met Senator Barbara Mikulski or that they just finished a Girl Scout photo-shoot celebrating the Year of the Girl? Who can actually say they have been in the building where George Washington resigned his commission as Commander in Chief of the Continental Army?—I can! I am proud of all that I have done with Girl Scouts and I will continue to stay active until I can be a leader myself. My biggest inspiration is my mother, Francine Rodney. In Jamaica, she ran her own store that sold food, appliances, clothes, shoes and other household goods; we even raised chickens. I have always wanted to run my own store as well so I plan to study business management. One of the main reasons my mother moved to the United States was to find greater opportunities. That is why I participate in many of GSCM’s programs because I want to take advantage of every opportunity to grow, learn, meet new people and be successful. What has been your most memorable Girl Scout moment? My most memorable Girl Scout moment was attending GSCM’s Year of the Girl Proclamation in Annapolis. Not only did I have a chance to meet three women Senators who were also Girl Scouts, I also appeared on the Senate Floor to accept the honor with CEO, Traci Barnett. That is an experience I will never forget. What is something that you have learned about yourself being a Girl Scout? People sometimes create their own disabilities. Me personally, I used to get frustrated at my accent. In Jamaica we talk fast and when I moved to the U.S., I would get annoyed when my school mates would ask me to always repeat. Sometimes my classmates would tease and bully me because I was different. So I decided I wouldn’t say much and became good at blending in. Being in Girl Scouts I have found that I have come out of my shell a whole lot. I have found that having an accent is what makes me unique and that if I slow down a bit, people can understand just fine. Not only did I do the S.T.E.M. (science, technology, engineering & math) demonstration for a room full of legislatures in Washington, D.C., I actually walked out on the Orioles baseball field with thousands of people watching on Opening Day. These are things that I would have been too nervous to do before Girl Scouts. Has being a Girl Scout impacted you in any way? Girl Scouting has helped me to be confident. About two years ago I used a chemical to straighten my hair and it began to fall out. From then I started braiding in synthetic hair to cover the damage and to get the look I wanted to achieve. I used to think that if I had long hair, then I would be pretty and people would not bully or tease me. These days I don’t think about stuff like that. I am learning to love who I am and being proud of what makes me unique. And what makes me unique is my love of my faith, historical buildings and politics. A few months back I took out the synthetic braids and I love wearing my own hair. That is something I am really proud of. I think I was making more of a deal of it than it ever really was. Why do you think girls need Girl Scouts? A lot of my friends don’t believe in themselves. Meeting women like Congresswoman Nancy Pelosi, Senator Barbara Mikulski and Girl Scouts of the USA CEO Anna Chavez gives me hope of what I can one day achieve. Girls need Girl Scouts to help guide them to make good decisions and help them build their self-esteem. When you feel good about yourself it empowers you to want to excel in all that you do. What would you tell a friend interested in Girl Scouting? You are never too old to be a Girl Scout. When you join Girl Scouts you don’t have to be anything other than yourself. Read more about Roxine’s Girl Scout experience in the latest issue of the Promise. Visit our website to learn more about the benefits of Girl Scouting and how to join.